The principal aim of Dental Materials is to promote rapid communication of scientific information between academia, industry, and the dental practitioner. Original manuscripts on clinical and laboratory research of basic and applied character which focus on the properties or performance of dental materials or the reaction of host tissues to materials are given priority for publication. Other acceptable topics include: application technology in clinical dentistry, dental laboratory technology, comprehensive reviews, research communications (technology notes), and editorial commentaries on pertinent subjects. Only manuscripts that adhere to the highest scientific standards will be accepted. The Academy’s objectives are: 1) to provide a forum for the exchange of information on all aspects of dental materials; 2) to enhance communication between industry, researchers and practicing dentists; and 3) to promote dental materials through its activities. Annual meetings and scientific sessions are held in conjunction with other dental organizations. The Academy sponsors symposia and scientific programs at international meetings; recognizes scholarship at all levels from students to senior scholars; and elects Fellows in the Academy. Updated subscription information is available at Elsevier Science. Please notify the Academy and your local postmaster of changes of address. Damaged issues or those lost in transit will be replaced when reserve stock permits. Back issues may be purchased: US$ 40.00 for members and US$ 50.00 for nonmembers. Note: the Academy does not have a reprint file. 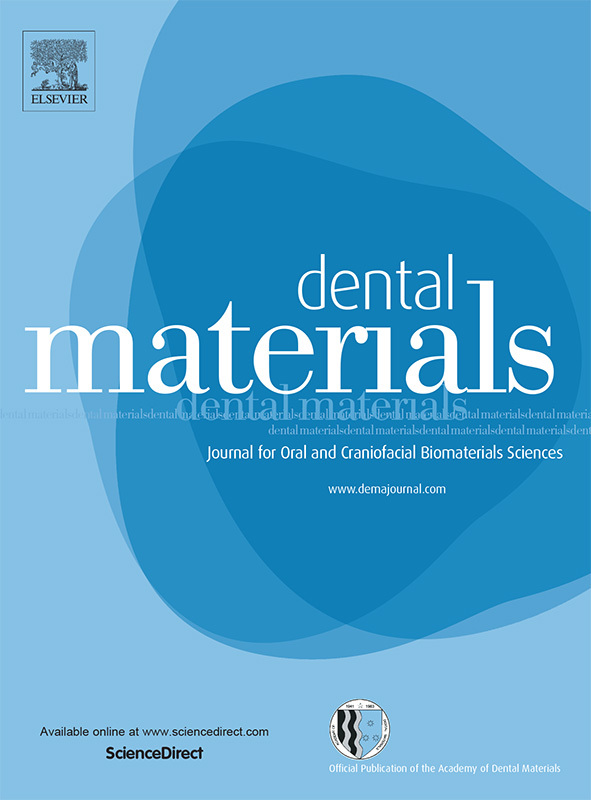 Dental Materials is available on ScienceDirect, the online journals platform from Elsevier Science. If your institution holds a licence to ScienceDirect, you will have access to full journal content by clicking here. ScienceDirect offers Articles in Press, publishing corrected author proofs online as soon as they are available, often weeks ahead of the printed issue! Publication online is simultaneous with the allocation of a DOI (digital object identifier) to your article, ensuring that it can be cited immediately amongst your peers. Full instructions to authors considering Dental Materials for their publication are available here.